Here’s something that probably doesn’t fit into your idea of a tech writer: I live in an intentional community, an “eco village,” if you will. My neighbors have chickens and vegetable gardens; more than one is a yoga instructor, and all of the houses were built by hand out of wood, mud, and straw. Does it surprise you that someone who makes a living writing about the startup world lives in a house with a composting toilet and unfinished adobe walls? It shouldn’t. It shouldn’t because environmentalism isn’t just for hippies anymore. As the effects of global climate change become more and more obvious every day, people are realizing that it’s time to start making some changes. Patchouli and tie-dye are no longer requirements to join this club and, in the startup world in particular, people are beginning to wed technology with environmentalism in fascinating, effective ways. One of those startups is Oroeco, a platform that brings together the best aspects of social media and living consciously. Oroeco is currently finishing up a campaign on Indiegogo before launching their beta run, so head on over their and show them some love with a few dollars before the first of the year. Founder Ian Monroe does a much better job explaining what Oroeco does than I ever could, so keep reading for a fascinating conversation with this Stanford lecturer turned startup founder. This is the future of environmentalism. This is environmentalism right now. Tell me about the inspiration behind Oroeco. I’ve been working on projects related to supply chain sustainability, renewable energy and international development for the past decade. The more countries I’ve worked in – 18 at last tally – the more I’ve been fascinated by the inner-workings of our globalized economy, and the more I’ve thought about what’s needed to make it truly sustainable. The main thing missing is information. None of us want to support environmental pollution or slave-like working conditions, but we often do without knowing it when we go shopping, simply because there’s no information about the true costs of supplying cheap stuff. Many companies also want to do the right thing, but they’re constantly pressured to cut corners and reduce costs because that’s what we as consumers demand. 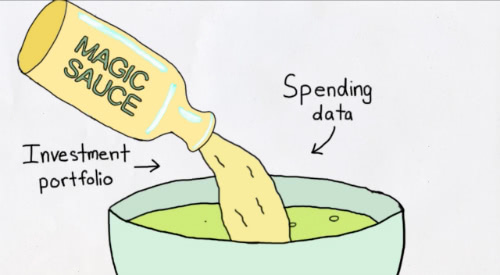 The good news is that there are now great databases that calculate the full “life cycle” impacts from pretty much all products and services. I first became aware of this wealth of data through my own research at Stanford, and collaborations with colleagues at UC Berkeley and MIT. These databases are constantly getting better, and linking to advancements in supply chain tracking technology. We’re not far away from the day when we can scan any item with our phone and see where all its component parts came from, and what environmental and societal impacts resulted in bringing these components together. GoodGuide has already built an awesome app that’s starting to do this. The other piece missing is having incentives so that we all act on information about which choices are more sustainable on a daily basis. Apps like GoodGuide are no good unless people use them. Most of us at least have a sense we should bike more or eat less red meat, both for the planet and our personal health. But we don’t all incorporate this information into everyday actions because we’re not reminded and rewarded for doing so. Technology is also providing a way to align these incentives. We have technologies like Mint.com that can automatically track how we spend and invest our money, thereby providing a way to automatically track the impacts linked to every dollar. The ubiquity of Facebook means we can now share our trials and tribulations with personal sustainability in our social networks, and social gaming is proving to be a major motivating force. 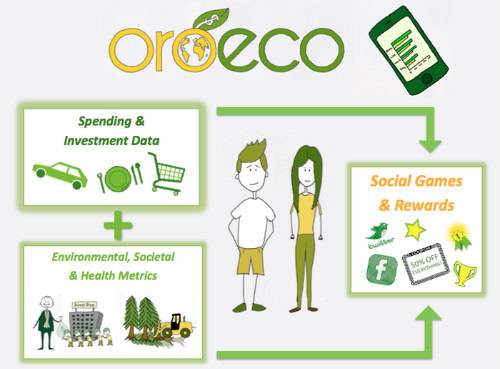 So the inspiration behind Oroeco came from both wanting to provide the information and incentives needed for a sustainable planet, and seeing that the datasets and technology are now in place to make this possible. 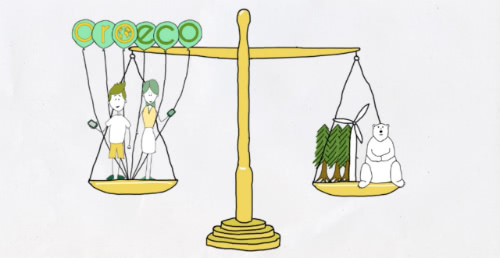 Oroeco will change the world by empowering us all to make better choices, which will scale into systemic change. 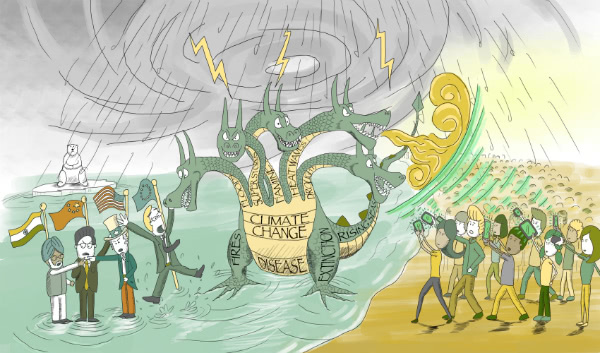 We’re starting with climate change because it’s a global issue that governments have thus far failed to solve. Informed and incentivized consumers can be a substantial part of the solution. Who’s on your team? Did you start Oroeco alone or with co-founders? Oroeco started as me and my friend David, who eventually had to leave to get a job that paid more than nothing. It took us a while to find a great web developer, but after a few false starts we eventually reconnected with Kirstin, an artificial intelligence guru friend from Stanford. A few months later we were lucky to link up with Yang, a UC Berkeley grad student who has a secret life as a code wizard from MIT, who then roped in her friend Dav, another Berkeley / MIT grad student who has many years in both software development and studying the psychology of how we make choices. 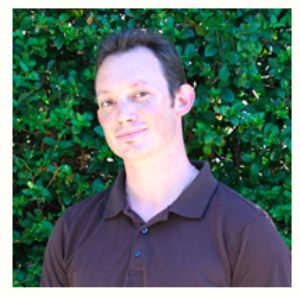 More recently we’ve added Leighton, an experienced backend developer from Stanford via Pinger, as well as Kamyar and Viksit, two solid developers who are working with us while wrapping up degrees at Berkeley and MIT, respectively. We’ve also got a great lawyer (Josh), a media maven (Bianca), a fabulous UI/UX designer (Sunny), and an awesome illustrator (Tobin) on call. It’s a tremendously talented team, and everyone is as passionate about the project as I am, mainly because they’ve all come to see the necessity for something like Oroeco through their own life experiences. Is this your first startup? What’s your background? Yup, this is my first plunge into the startup world, though I’ve been inspired by a number of friends who started successful companies, like Lukas Biewald (CrowdFlower), the late Corwin Hardham (Makani Power), Gia Schneider (Natel Energy), and Alex Loijos and Sahil Sahni (LinkCycle). I’ve worked for the last decade as an environmental scientist and engineering consultant, first for Winrock International, then HDR Engineering, then my current gig as a lecturer on energy and climate at Stanford University. I’ve also worked a bit with Natural Resources Defense Council (NRDC) and Business for Social Responsibility (BSR), and consulted for folks ranging from small farmer cooperatives to governments and corporate titans (like Coca-Cola, Lafarge, Nike and Walmart). One of my favorite side activities is teaching a course on environmental issues in China to US college students in Beijing, and talking about how China’s environmental problems are linked to consumption in the rest of the world. So while this is my first startup, I’ve been surrounded by a global network with a lot of relevant wisdom I can tap into, which has been tremendously helpful in the process. I actually also hope Oroeco is my last startup. It’s been a tremendous amount of fun, and I can’t think of anything else I’d rather be doing with my life. I hope I’m helping build something that lives well beyond me. 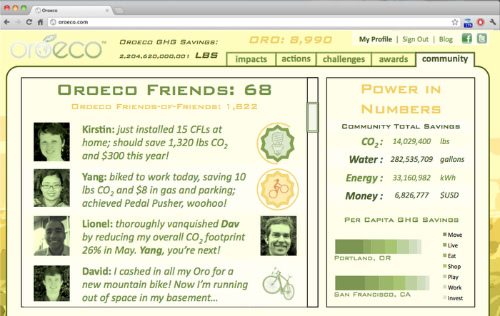 Oroeco combines social media tactics (sharing, friends, etc.) with eco-consciousness. Can you talk a little about the process of determining which social media aspects you wanted to use? This is something we’ll constantly be working to improve, as we think the social aspects of our user experience will be the key to our success. Can we make Oroeco as viral and engaging as Words With Friends, Angry Birds or Farmville? And can engaged social gaming translate into real world behavior change that scales up to a happier, healthier planet? I think so, but it will be a process. Our first test is the feedback we get from the beta testers we recruit through Indiegogo, which folks need to sign up for BEFORE January 1st (shameless plug). Most of us – myself included – can easily get overwhelmed by a bunch of numbers that quantify sustainability metrics. What’s much more relevant is showing how we’re doing compared with our friends and neighbors, and how different choices compare to each other, which we can now do through social networks and mobile computing. So our initial interface will look similar to what Opower is doing for home energy use, though we’ll be adding more points and rewards. As our resident cognitive psychologist, Dav Clark is really the expert in this, so he’s the one you should talk to if you want to dive deeper. He’s building a quite sophisticated analytics engine into Oroeco, so we’ll be able to tailor the social gaming elements based on user preferences. We’re also trying to make Oroeco’s platform as open as possible, so other developers can use our data to create features we haven’t considered, and Oroeco user data and points can be incorporated into other games and services. My dad is a total doom and gloom environmental apocalypse type who is convinced we’re on a path to inevitable destruction. What would you say to someone like that to convince them otherwise? I grew up on a small farm in Northern California, where a lot of my friends, neighbors and relatives also fell into the environmental apocalypse camp. Some of it’s generational. Aging activists (like my parents and a younger version of me) took to the streets to change the world, only to see many of their dreams washed away by political ineptitude and corporate greed. So it’s understandable they’re bitter and defeatist. But technologies are really now empowering us to reinvent democracy and vote with our wallets, and there are lots of folks in government and industry who want to do the right thing, provided voting consumers lead the charge. So the power is finally in our hands, we just need to start using it. The younger generation gets this. Our parents’ generation is starting to get this too. Some of Oroeco’s most ardent supporters are Baby Boomers who use Facebook and smart phone apps even more than I do. What made you decide to be a part of Start-Up Chile? We wanted to do a startup accelerator to speed up Oroeco’s development, but most of the options in the U.S. seemed to be asking for a lot of equity (up to 15%) for not very much money (typically ~$15k). At $43k of equity-free funding, Start-Up Chile was the best deal we could find. Start-Up Chile has also been an amazing opportunity to connect with an international community of entrepreneurs. I first heard about the program from Josef Dunne and Mayel de Borniol, the founders of Babelverse, who touted the networking aspects of the program. Our mission is to see Oroeco scale up to become something that nearly everyone on the planet uses to inform their decisions. We’re hoping that the network from Start-Up Chile can eventually help Oroeco go global. Beyond funding, global networking and the other perks you’d expect out of an accelerator, it’s also been fascinating to see Chile take the lead in attracting top tech talent from all over the world, even as the US makes getting a work visa increasingly difficult. I’d love to see Start-Up Chile replicated elsewhere, as I think programs like it can help kickstart developing economies by encouraging indigenous innovation with global roots. What are some other ways that people can start making changes to improve their environmental impact? Beyond signing up to beta test Oroeco through Indiegogo (another shameless plug), I’d suggest that all your readers check out UC Berkeley’s CoolClimate calculator, which shows you how you can save both money and the climate at the same time. Many things you can do to reduce your footprint are obvious, like drive less and bike or use public transit more. We just need to be encouraged and rewarded to do these things on a regular basis. Other things are more surprising, like the fact that (for most people) eating red meat one day less per week will reduce your carbon footprint by more than upgrading to a Prius. And less red meat will also reduce your impacts on deforestation, biodiversity loss and water use, as well as reduce your risk for getting many cancers. Another surprise to many people is the fact that flying across the country is as bad for the climate as driving an SUV. International flying is my biggest environmental sin, as it negates most of the other sustainable choices I make. The only way to get around it is to fly less or buy carbon offsets, at least for now. What other ways do you see tech interacting with environmentalism to make a positive impact? We’re reaching a point where information technology and clean technology are becoming inseparable, with both dependent on each other. Tech needs a lot of energy to run a sea of servers, and it’s essential for our future that this energy be clean. Environmentalism requires that information about environmental impacts be relayed to decision-makers, which ultimately means us, and tech is vital in helping this happen. On the consumer tech side, there are already some fantastic tools out there. I’ve mentioned GoodGuide and Opower already, which both have killer eco apps of their own. There’s also WattzOn and Recyclebank, which reward green actions, and Nest, which is making the coolest thermostat I’ve ever seen. Then there are companies like LinkCycle, Sourcemap and Trucost who are constantly improving the web of life cycle sustainability data. It sounds cheesy, but I draw bits of inspiration from nearly all of my family and friends. I consider myself the sum of my surroundings, and I’ve been tremendously lucky to be surrounded by brilliant and passionate minds, as well as a large dash of natural wonders from my home near San Francisco and my travels around the globe. I love both backpacking and urban exploration, though I don’t do either as often as I’d like. I’m a pretty lousy surfer, but that doesn’t keep me from trying. Any/all pick up sports bring joy to my life, particularly soccer, football and ultimate frisbee. Probably my favorite use of time is sharing meals and adventures with friends, though; the specific activity doesn’t much matter, as long as the company is good. When you love what you’re working on it’s easy for it to become synonymous with life. Oroeco has been pretty all-consuming of late, though I’m trying to get better at taking time off to enjoy this beautiful little space rock of ours. I’d say the most effective hack for making that happen is finding a place where you’re really offline. We still don’t have mobile service on the farm where I grew up. So that chunk of land surrounded by forested hills has become a great retreat destination, though I have to unplug our wifi for it to get really relaxing! What’s the biggest sacrifice you’ve made for Oroeco? Was it worth it? I could be making a lot more money doing just about anything other than Oroeco, but I’m not someone who’s particularly motivated by money, so that’s not really a sacrifice. Probably the toughest thing is not spending as much quality time I’d like with the people I love. Hopefully that will change at some point, but there’s a lot more hard work ahead first. Well, there’s Oroeco and Indiegogo, for starters. There’s also Facebook and Twitter, as well as our blog, which we’ll be making more active in the coming months. My personal Twitter is @iemonroe, and I just started blogging periodically for Huffington Post. You can also track down my Stanford lecturer alter ego at stanford.edu/~imon.